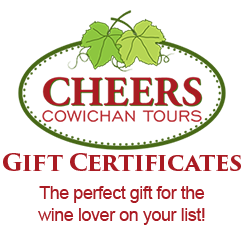 When you participate in a tour with Cheers you will be asked to sign a waiver, below is the contents of this waiver for your review should you wish to read it in advance of your tour. Please note, we do our best to keep our website updated as much as possible but this may not be the exact version presented to your on your tour, we still recommend reading any papers that you sign. If you have any questions please do not hesitate to contact us. I agree and understand that by engaging in a tour with Cheers Cowichan Tours, I waive all claims of liability against Cheers Cowichan Tours and the partner organizations involved in the tour. This includes the owners, tour guides, employees and staff of Cheers and any brewery,winery,farm or destination visited on tour. I am voluntarily requesting a tour and I expressly agree to assume the entire risk of any and all accidents or personal injury which I might suffer during my tour, whether due to negligence or not. As a participant on a winery or brewery tour, I understand that alcohol will be consumed and that I am over the legal drinking age of 19 years. Cheers role is limited to arranging tours, providing transportation and providing access to partner organizations and they do not assume liability for any bodily injury, accidents, or damage and theft to personal property that may occur while on tour. I understand that I willingly enter into this agreement when I purchase or accept a spot on tour. I also acknowledge that while on tour I will be boarding and unloading from the Cheers passenger van, engaging in walking tours of breweries and knowingly accept any and all risks associated. I also understand that I am responsible for my behaviour and agree to conduct myself in a respectful manner towards Cheers and all its tour guides, employees and owners, and towards all partner wineries and breweries on tour. Cheers has the right to refuse service to customers who violate this code of conduct at any point while on tour. There will be no refunds in these instances. I declare that I have read this release and waiver of liability and indemnity agreement, and further agree that no oral representations, statements or inducements apart from the foregoing written agreement have been made. By registering for a spot on tour, you grant Cheers the right to use any photos or videos collected of you for promotional, social media or commercial purposes and agree to grant Cheers a royalty-free license to use these images or videos of your likeness. If you don’t wish to be photographed or to have your images used, just let us know! We take lots of photos for guests using their own devices and we have an active social media presence. Feel free to tag, tweet and like to your hearts content!